It doesn’t matter if you are a beginner investor or one with advanced knowledge of crypto, you should always strive to learn more. ICOholder has published an infographic listing the sources of that knowledge. Invest Like the Best is a podcast by Patrick O’Shaughnessy about investing. There is a three-part audio documentary called Hash Power which introduces newbies to the world of cryptocurrencies in an easy to understand manner. If you prefer learning through reading, The Crypto Intro is a book that distills the knowledge from other sources into a guide for readers with zero knowledge. The book is great for absolute beginners who want to learn how to choose an exchange, create an account, and buy crypto for the first time. Cryptocurrency Trading & Investing is a book by internet entrepreneur & blockchain advisor Aimee Vo. This isn’t really geared towards those of you who already have a high level of crypto knowledge, but if you are a beginner, this book offers a lot of basic knowledge while avoiding the technical jargon found in many other sources. Bitcoin: The End of Money as We Know It is a 2015 documentary which can be viewed as a crash course about digital currencies. The movie questions the principles behind money and cryptocurrencies and it is a great starting point to gain an understanding of the crypto market. Banking on Bitcoin is another documentary about cryptocurrencies. This one focuses more on the ideological battle between mainstream capitalism and crypto supporters. The movie shows the key players in defining the future of blockchain. If you want to know more about who is fighting the crypto battle and where it could lead, this is a must watch. You might already be familiar with Udemy. 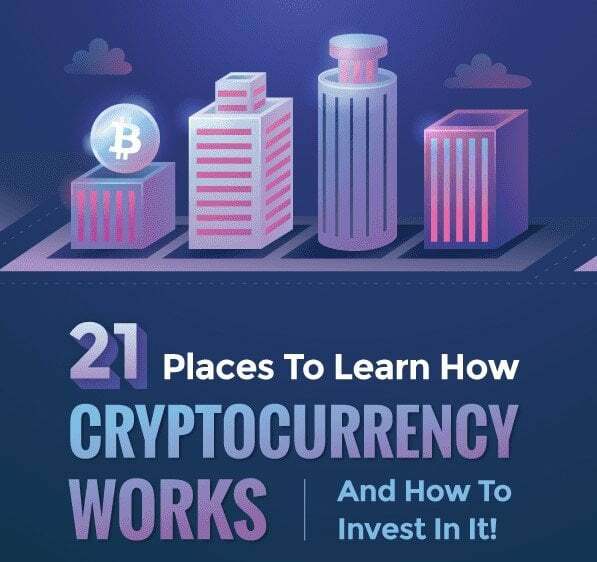 It is an internet based platform for education which offers courses on various topics; The Complete Cryptocurrency Investing Course For Beginners is one of the well-rounded courses they are offering. It teaches all the basics you need to know before entering the world of crypto investments. Another good course for finance experts who are seeking entry-level blockchain knowledge is Blockchain for Finance Professionals by Peter Mikkelsen. It is a course which is designed to be understandable by everyone but focuses more on finance experts. Blockgeeks is a learning and training platform which offers a variety of courses based on your needs and wishes. The topics they cover span from beginner courses to master courses, offering corporate training as well as training for individual enthusiasts. Cryptoassets: The Innovative Investor’s Guide to Bitcoin and Beyond is a book written by public fund manager Chris Buniske and angel investor Jack Tatar. It’s is a great investment manual for both novice and advanced traders and investors, covering all areas of crypto trending and investments. If you already started investing in cryptocurrencies and want to learn more about specific exchanges and coins, forums are a great place to find more information. Cryptocompare is a website that has a dedicated forum for each individual coin and exchange. Consider it if you want to learn from other investors and enthusiasts. Bitcoin Forum is probably the biggest forum dedicated solely to crypto. It has a familiar “old-school” forum look and has millions of posts for people with different interests. It is hard to imagine that you won’t get an answer to any question you have about crypto on Bitcoin Forum. As with many other fields, Reddit is always a good place to ask questions and get answers. R/bitcoin is a subreddit with close to 1 million subscribers dedicated to cryptocurrencies. If you prefer learning through discussions and already have enough knowledge to know what to ask, this is the place to go. Once you start investing in crypto, you will want to check real-time prices of different currencies. CoinMarketCap is one of the places to get such information.You will also want to follow what happens around the world. One of the most established news sites for the crypto market is Coindesk. If you prefer reading articles that are a bit shorter than those at Coindesk you should check out CoinTelegraph, which mostly focuses on articles around 500 words in length. The Business Blockchain is a book that focuses on executives and managers who want to learn more about the blockchain technology and its effects on financial services. It is an excellent book for those with advanced knowledge, but it should be avoided if you are a complete beginner. Coin Mastery is a podcast by Carter Thomas that analyzes daily content around cryptocurrency, main topics of the show are investing, trading and psychology of the market. It is one of the best sources for those who already have a solid knowledge but want to learn more. Epicenter is a podcast for industry people who are interested in a deeper analysis of the crypto markets and new ideas on blockchain projects. It is not a show for beginners and leans more on the side of those already working with the crypto market. The Bitcoin Podcast is a network of podcasts which covers a variety of topics. If you are interested in the technical side of the market, this is definitely a network for you. Maybe you are not a podcast type of person and YouTube is a source you prefer. In that case, you should check out DataDash, a YouTuber with over 300k followers who covers most cryptocurrency-related topics. Some of you may be looking for a channel that focuses more on investments. Crypto Investor is a YouTuber you may consider.